A heavily depleted Tottenham exited a second cup competition in four days, as Crystal Palace brought their FA Cup run to an end on a cold afternoon at Selhurst Park. Mauricio Pochettino was already without Harry Kane, Dele Alli and Son Heung-min, but decided to rest Christian Eriksen too – and the absences were keenly felt as Spurs found it almost impossible to break down a resolute Palace defence featuring only Patrick van Aanholt from Roy Hodgson’s regular back line. As it was, the hosts took an early lead through Connor Wickham, tapping home after Paulo Gazzaniga could only parry Jeffrey Schlupp’s initial effort – and former Tottenham man Andros Townsend added a second from the penalty spot before half-time. Kieran Trippier was given the chance to pull one back soon after, but the England right-back blasted his penalty wide – and, despite an awful lot of possession, Spurs were unable to find a way back in the second half. Palace, FA Cup runners-up three seasons ago, now face a trip to Doncaster Rovers in the fifth round. 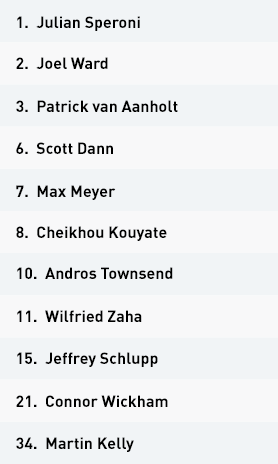 Roy Hodgson set his Crystal Palace team up in a 4-3-3 formation, with Cheikhou Kouyate, Max Meyer and Jeffrey Schlupp as a midfield three behind Andros Townsend, Wilfried Zaha and central striker Connor Wickham. Palace were happy to concede possession for the majority of the game – they registered just 37 per cent across the 90 minutes – and looked to utilise the pace of Zaha and Townsend as well as playing direct into Wickham. 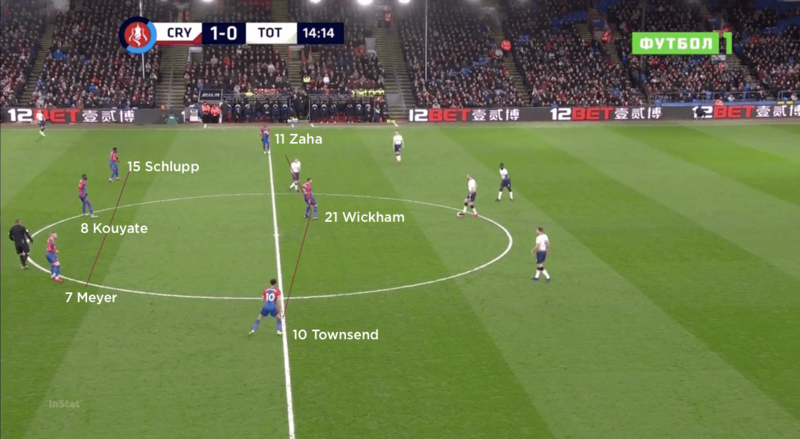 Zaha and Townsend would be positioned slightly ahead of the midfield line out of possession; this allowed them to be in an advantageous situation to counter-attack should Palace regain the ball. Towards the end of the game, Zaha recovered less and remained higher for the counter, while Townsend dropped in more to help defend.  Palace’s other noticeable strategy in attack was to use the width provided by full-backs Patrick van Aanholt and Joel Ward to send crosses into the box. Here, Wickham would be joined by runners from midfield, usually in the form of Meyer and/or Schlupp – as seen in the latter’s role in Wickham’s opening goal after just nine minutes. Out of possession, Palace utilised a combination of 4-3-3 and 4-5-1, depending on where Zaha and Townsend were positioned. The hosts set up in a mid-block that also took on the form of a low block on several occasions, particularly after both goals and towards the latter stages of the game. When Tottenham were building, Palace were generally happy for centre-backs Davinson Sanchez, Jan Vertonghen and Juan Foyth to have possession. 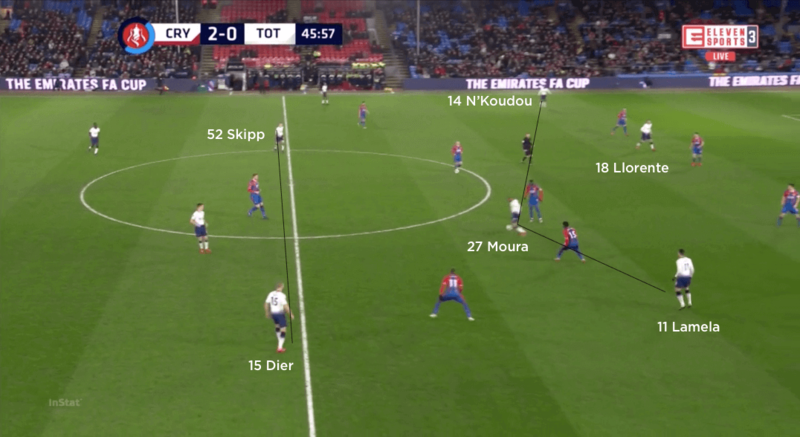 Wickham would position himself between midfielders Eric Dier and Oliver Skipp, while Townsend and Zaha operated between the outside centre-back and wing-back on their side. 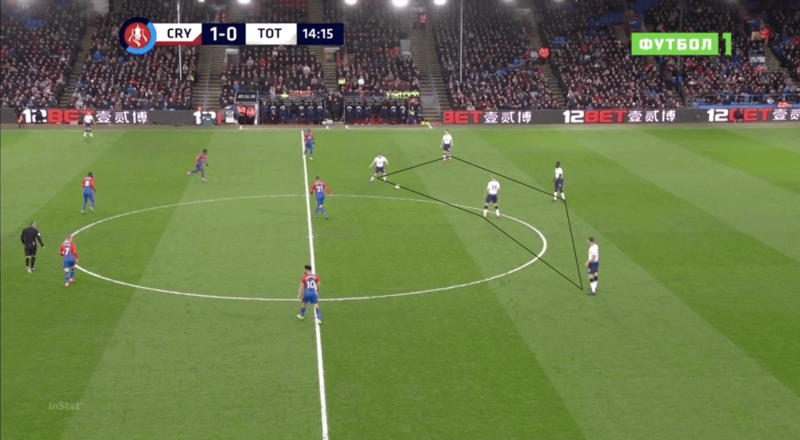 This meant they could press the centre-back if necessary, while leaving only an aerial passing line into the wing-back – which in turn allowed more Palace players to support if necessary. Kouyate, Meyer and Schlupp worked to prevent penetration through the middle, and they found this relatively easy in the first half with only Lucas Moura, Georges-Kevin N’Koudou and Fernando Llorente behind them and four Palace defenders to support them. 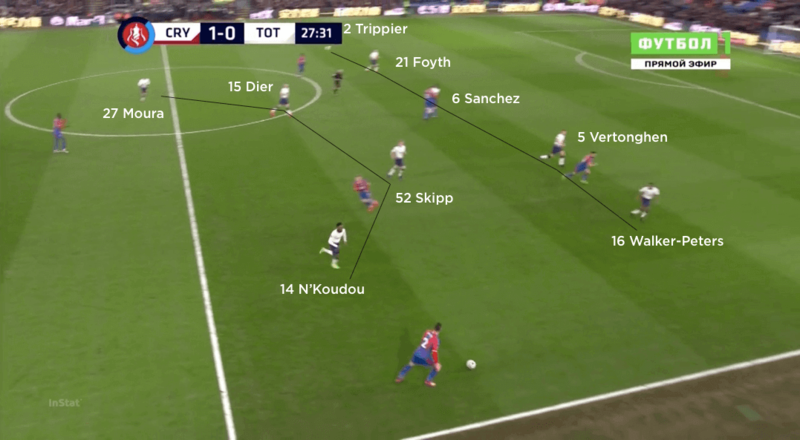 If Wickham chose to press the Spurs centre-backs, Meyer and Schlupp would look to drop with Dier and Skipp while Kouyate provided cover behind them and blocked the ball into Llorente’s feet. All in all, the disciplined and organised nature of the Palace structure out of possession limited Spurs in their attacking options. When balls were crossed in to Llorente from wide areas, the midfielders worked hard to track back so the forward felt pressure from both front and back. This commitment throughout the Palace team ensured that the visitors struggled to create the quality of chances required to find a way back into the game – and helped the hosts move comfortably into the last 16. Crystal Palace used a 4-3-3 formation in possession, with Wilfried Zaha and Andros Townsend supporting lone striker Connor Wickham. Cheikhou Kouyate operated as a single pivot in midfield. Out of possession, the hosts used a 4-3-3 or 4-5-1 structure, depending on the positioning of Zaha and Townsend. Here, they are higher, alongside Wickham in a 4-3-3. 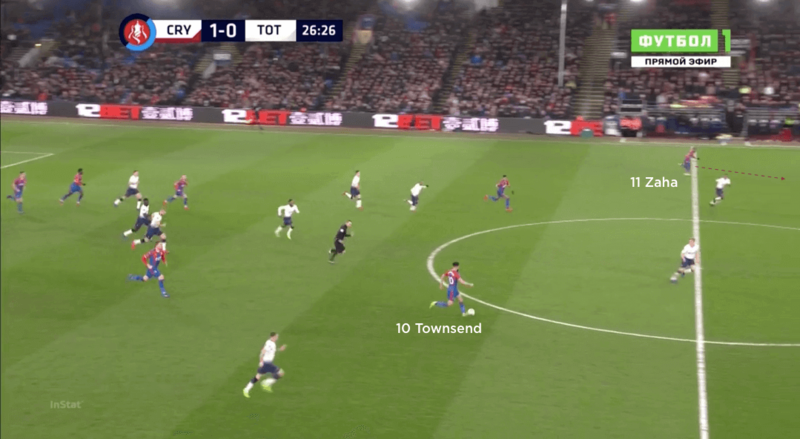 Palace’s key threat throughout the game was on the counter-attack, with Zaha and Townsend’s higher positioning out of possession being used to their advantage in transition. Tottenham lined up in a 3-4-2-1 formation, with Kieran Trippier and Kyle Walker-Piters providing the width from wing-back. Oliver Skipp and Eric Dier sat at the base of a midfield box, behind Lucas Moura and Georges-Kevin N’Koudou. The visitors dropped into a 5-4-1 out of possession. The wing-backs fell alongside the three centre-backs in a defensive line of five, while the midfield box flattened out somewhat. Spurs had numerical issues in the first half – in simple terms, too many of their players were in front of the Palace block. 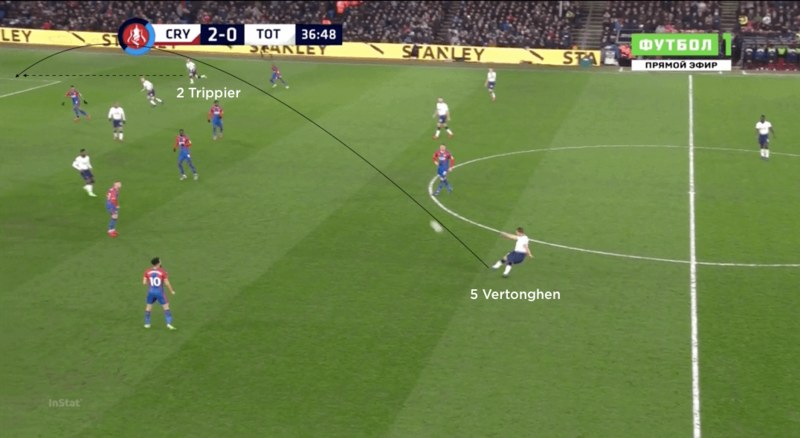 They often looked to send diagonal passes from deep central positions for the runs of their wing-backs – here, Jan Vertonghen for Trippier – who would then try to cross first time. Chasing the game, Tottenham switched to a 4-2-3-1 shape in the second half – Erik Lamela replaced Vertonghen and slotted into one of three attacking midfielder roles behind Llorente. 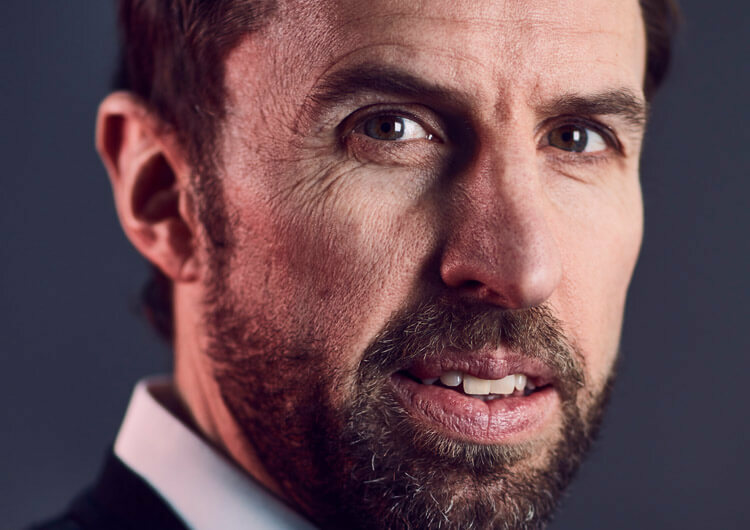 The new shape provided opportunities to create overloads out wide or create spaces inside – but a lack of quality in the final third cost them any chance of getting back into the game. Mauricio Pochettino set his Tottenham team up in a 3-4-2-1 formation, with Eric Dier, Oliver Skipp, Lucas Moura and Georges-Kevin N’Koudou essentially forming a box in midfield. 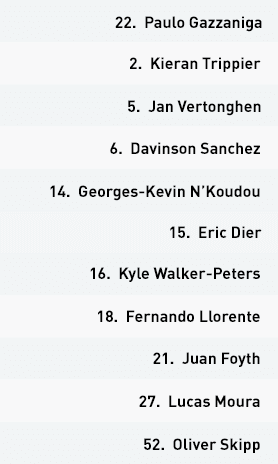 Kieran Trippier and Kyle Walker-Peters provided the width from wing-back, while Fernando Llorente led the line. Spurs had the majority of possession but really struggled to break through the Crystal Palace block. Initial struggles in the first half were largely numerical, as the visitors regularly had Dier, Skipp, Vertonghen, Sanchez and Foyth in front of the entire Palace team, leaving only Moura, N’Koudou, Trippier, Llorente and Walker-Peters to find space in a very congested attacking half. 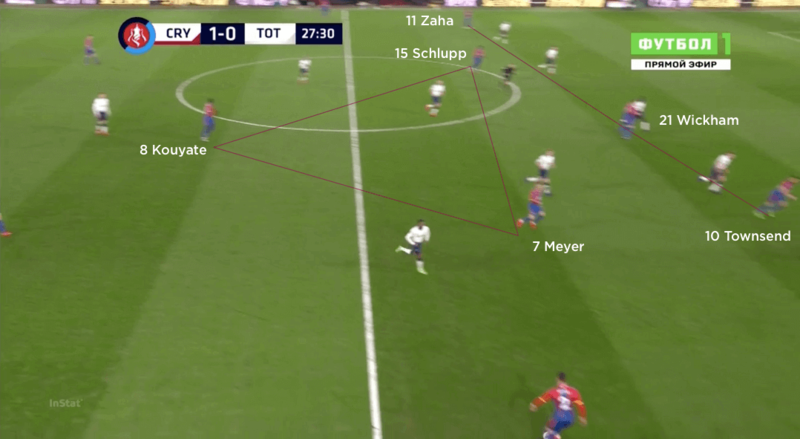 Tottenham thus looked to exploit the wide areas, particularly as Wilfried Zaha and Andros Townsend were higher up than their midfield counterparts, and Zaha in particular was inconsistent at tracking. 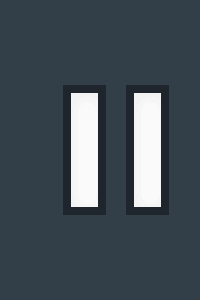 They tried to position N’Koudou and Moura between the Palace centre-back and full-back, in order to prevent the full-backs from moving out to Trippier or Walker-Peters too early – but Palace still had the numbers to be comfortable defending these situations. Spurs also looked to send diagonal passes from deep central positions in behind the full-back, for the wing-backs to collect and cross first time. In the second half, Spurs switched to a 4-2-3-1, with Erik Lamela replacing Vertonghen and slotting in as one of three attacking midfielders behind Llorente. 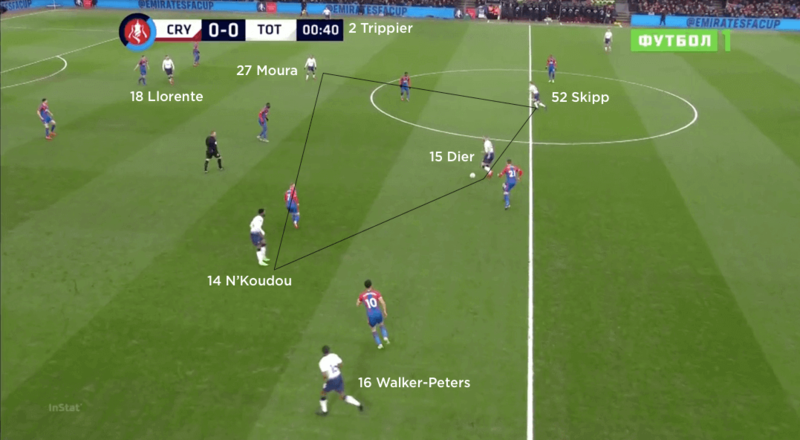 The three operated centrally, however, which allowed Trippier and Walker-Peters to provide the width even from their starting positions in a back four. The new structure had the potential to strengthen Spurs’ access in wide areas, either through a three-on-two overload or by getting midfielders in behind the full-backs to drag the centre-backs out of shape and create more room for Llorente. 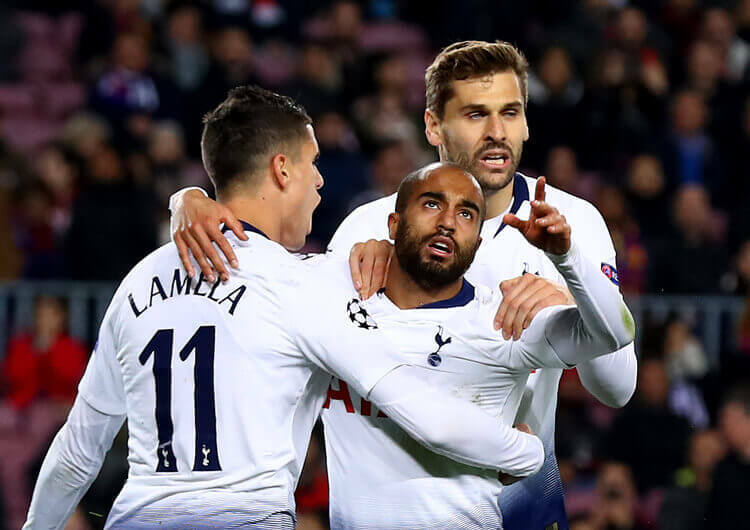 The extra man in attacking areas also helped Moura and Lamela receive in between the lines and run at the Palace back line – this increased the final-third entries, but a continued lack of quality in the area meant Tottenham remained goalless and exited a second cup competition in four days. Out of possession, the visitors utilised a 5-4-1 mid-block, with the wing-backs dropping into a back line of five and N’Koudou and Moura joining Skipp and Dier in a midfield four. Spurs spent relatively little time out of possession, such was their dominance of the ball, but the roles were fairly basic when they did. 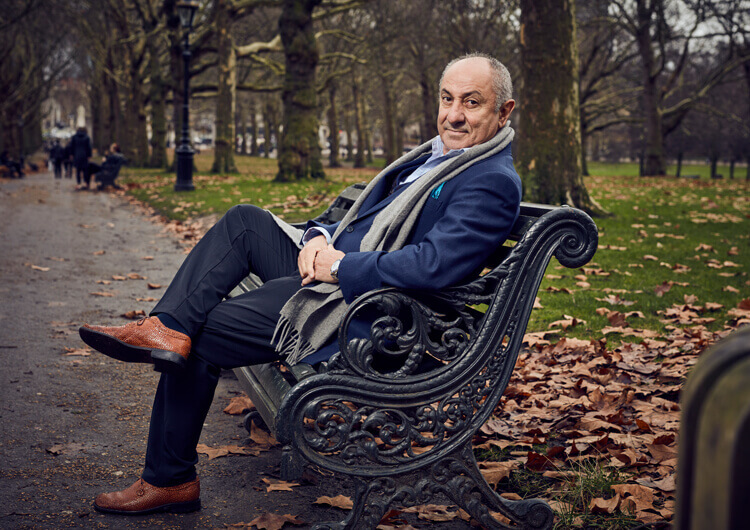 Moura and N’Koudou would press the Palace full-backs, while Dier and Skipp dealt with the two nearest central midfielders – Tottenham’s wide midfielder on the opposite side would then tuck across to affect the third Palace midfielder. The majority of Spurs’ defending came in transition, when faced with Palace’s preferred counter-attacks. 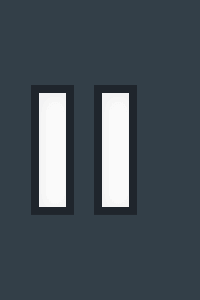 In these situations, Foyth was notably impressive when dealing with the ever-dangerous Zaha – one significant bright spot on an otherwise disappointing day for Pochettino and co.